Separate the cake batter into two bowls. There are approximately 3 cups total of cake batter so put 1 1/2 cups into each bowl. 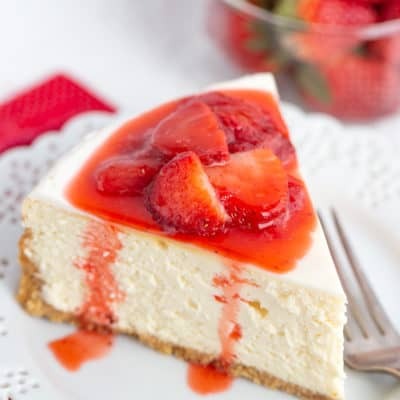 To the first bowl of cake batter add 1 tablespoon of red food coloring. 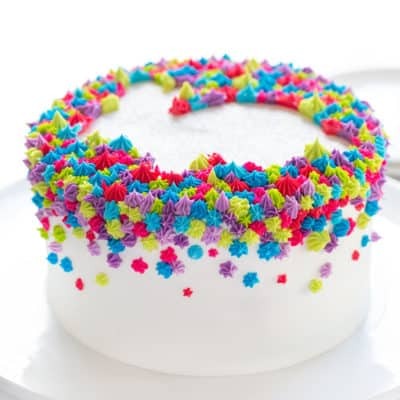 If you use a large amount of food coloring like I have, add a little McCormick Vanilla Extract to ensure the cake tastes as sweet as it looks! Why do I prefer McCormick? Not only can I find it everywhere (and adore that my readers can too!) but I love knowing I am using a product that is the best quality. 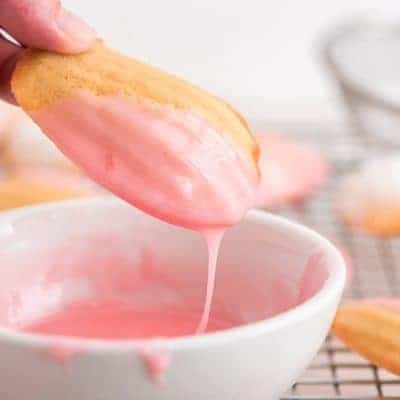 Once you have added the red food coloring and vanilla carefully mix until fully incorporated. Pour into a prepared (I lined my pan with parchment paper and coated it with Homemade Baker’s Spray – or GOOP) pan. Once the batter is in the pan, tap it one the counter to force air bubbles to the top. Bake for 12-15 minutes. At 6 minutes remove pan and tap it on the counter to remove any air bubbles. When cake is done baking invert it onto a cooling rack. While red cake is baking prepare green cake batter. Bake green cake for 12-15 minutes. At 6 minutes remove pan and tap it on the counter to remove any air bubbles. When cake is done baking invert it onto a cooling rack. Chill cakes until ready to assemble. 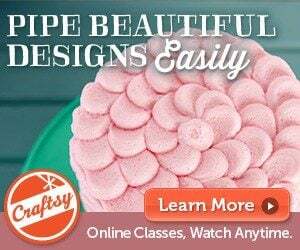 Creating a beautiful and delicious mini-cake for your Holiday celebration has never been easier! 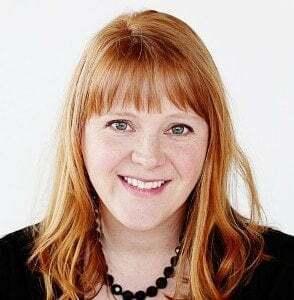 When ready to assemble place green cake on a flat surface covered with parchment paper. Cover with thin layer of buttercream. Smooth out the frosting so that it is flat and even. 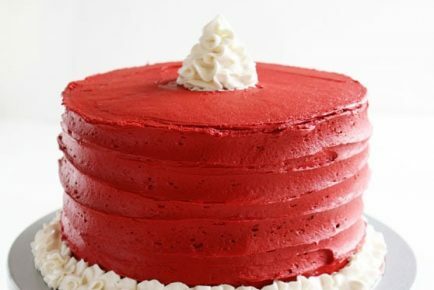 Place red cake on top of buttercream. 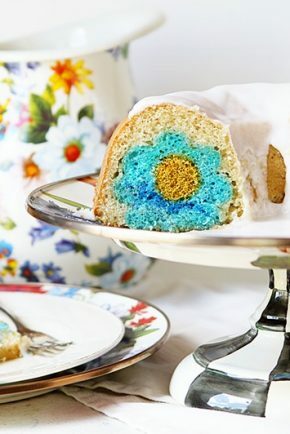 You may need to chill cakes more at this point. 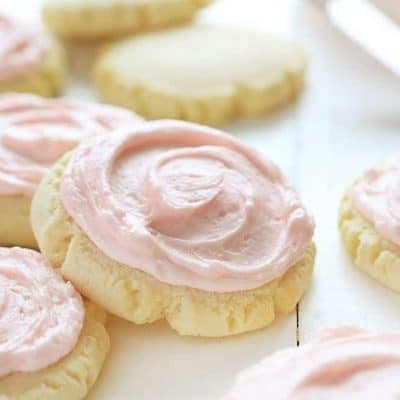 If they are too soft you will not get precision cuts with the cookie cutter. Place a cookie cooling rack on a sheet pan lined with parchment paper. Prepare a second sheet pan and cover with parchment paper. Press cookie cutter into the cake and then press all the way through. 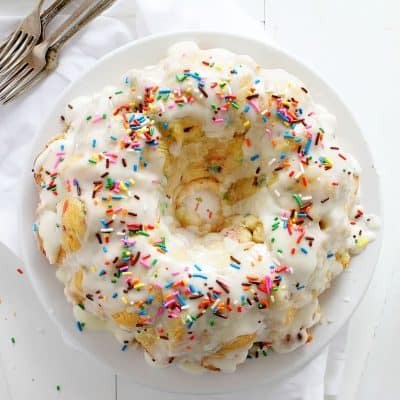 Repeat this seven more times so you have 8 total mini cakes. Set mini cakes on the cooling rack. Melt chocolate according to the directions on the package. 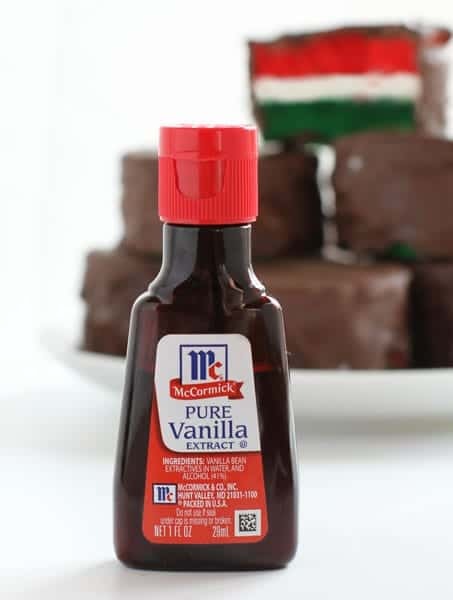 Pour chocolate over mini cake then smooth out chocolate with an offset spatula. 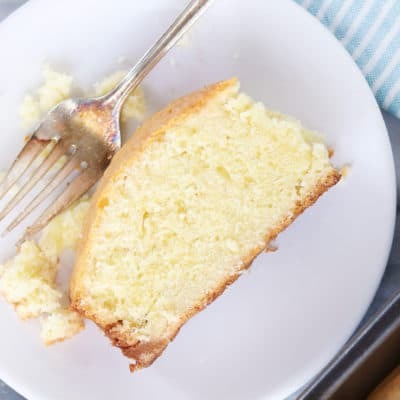 Once mini-cake is completely covered, put offset spatula under the cake and carefully lift it up and move it to other sheet pan covered with parchment paper. 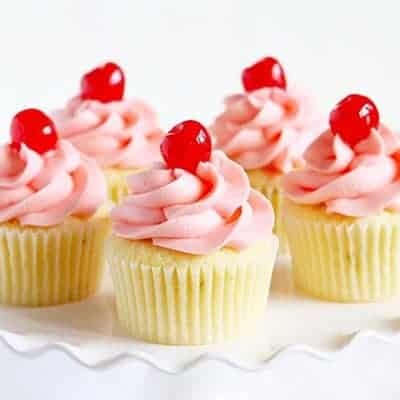 Repeat until all the mini cakes are covered. You should only need one coat of chocolate. 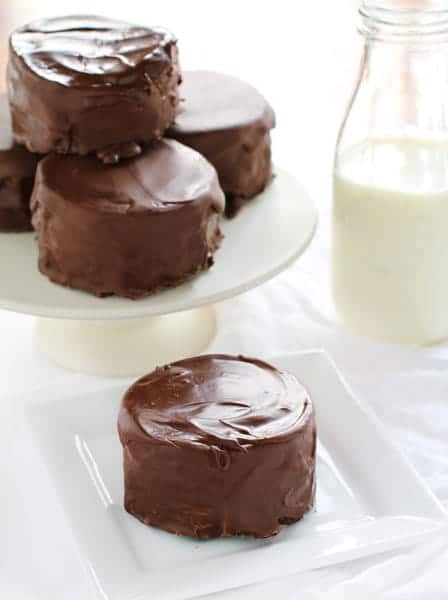 Cool mini cakes for about 30 minutes, or until chocolate is hard. These Fancy Christmas Cakes are a fantastic way to share joy with others! 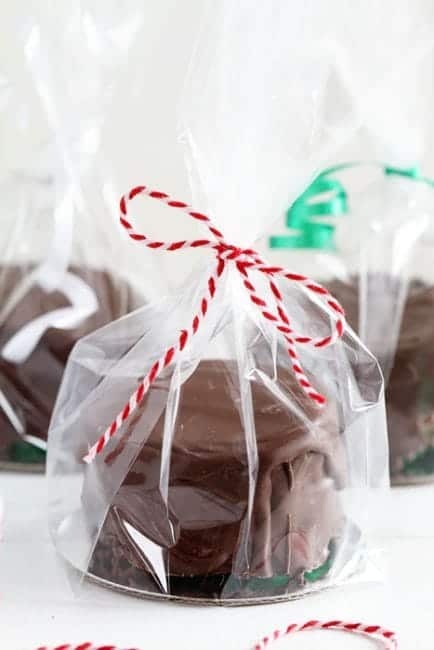 Package them up in cellophane, tie with a pretty string and send them to someone you love! 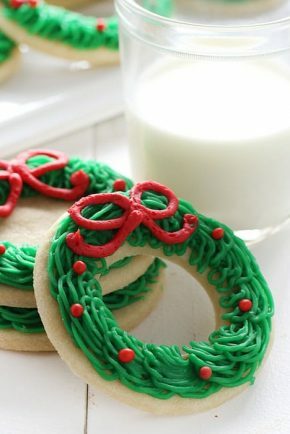 These are so cute and festive! 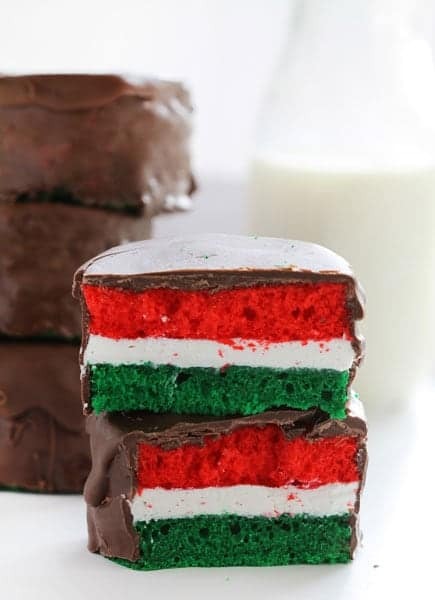 And I LOVE ding dongs, so I can’t wait to make these! The colors of the layers are just wow! So festive! I have a lot of family members who would love these for Christmas! 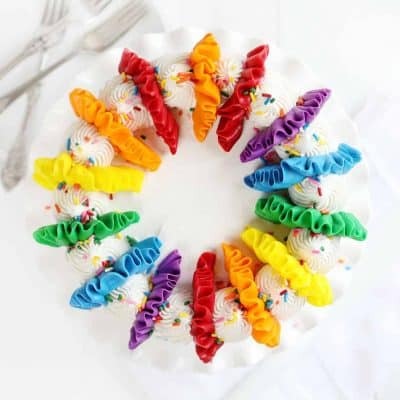 This is such a cute Christmas gift, or perfect for a classroom party! Oh my gosh Amanda, these are the cutest! what I really like are the videos. I will try this next week. 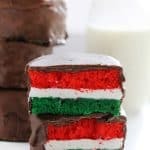 This Sunday I am making the Santa belt cake. Can’t wait. What a delightful cake it will be very papuler with all age groups ! Love the Christmas surprise that’s revealed with your first bite. 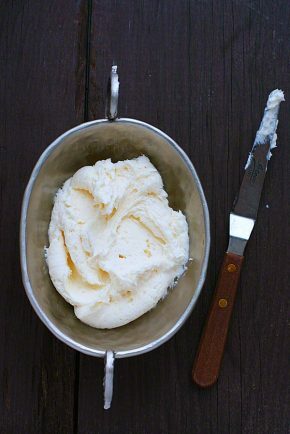 And thanks for all the terrific tips—like adding good vanilla to a box mix! Thank goodness I have a stash of McCormick food colorings and flavorings in my pantry. Oh my gosh these are so cute! They are the perfect little gift and snack. I love all the color you packed into these little treats. 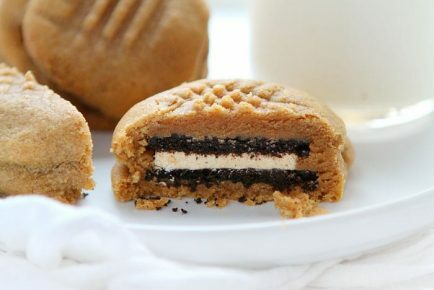 I just made these! They are absolutely adorable! Thank you Amanda for all you yummy recipes! Yay!! So glad you liked them! I do not own a fancy upright mixer but have a kitchen aid brand hand mixer that has whisk type beaters rather than traditional beaters. Will that work for this? I dont see why not. It is just cake mix. 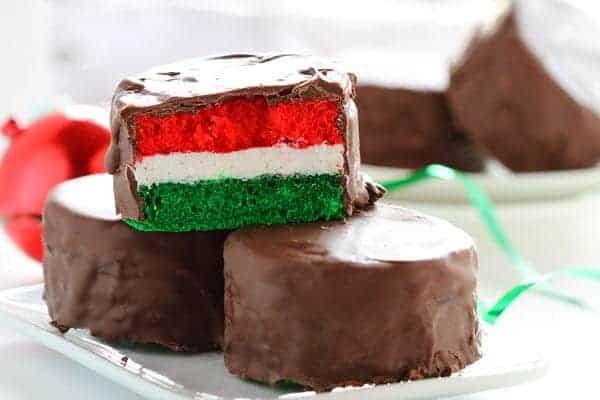 You realize this is the Flag of Hungary? 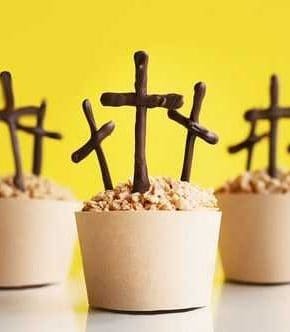 Amanda I am wondering if chocolate and white chocolate ganache would work on these?